"Well, when your preoccupation is trying to stay alive and not get shot on the street on the way to and from school, it's very difficult to prioritize studying for a history exam." 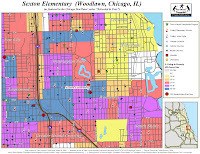 This reminded me of a series of Chicago SunTimes articles from 2008, under the title "schools in fear". I wrote several articles following this, and hope you'll take some time to read them. 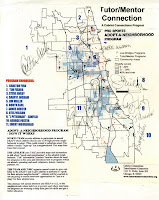 I've been using maps since 1994 to point to neighborhoods featured with high profile media stories. 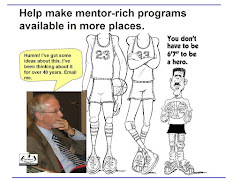 My purpose is to draw attention and support to volunteer-based tutor, mentor and learning programs already operating in these areas, or to help new programs start in places where few, or none, exist. I was leading a volunteer-based program in Cabrini Green when I launched the Tutor/Mentor Connection (T/MC) strategy. 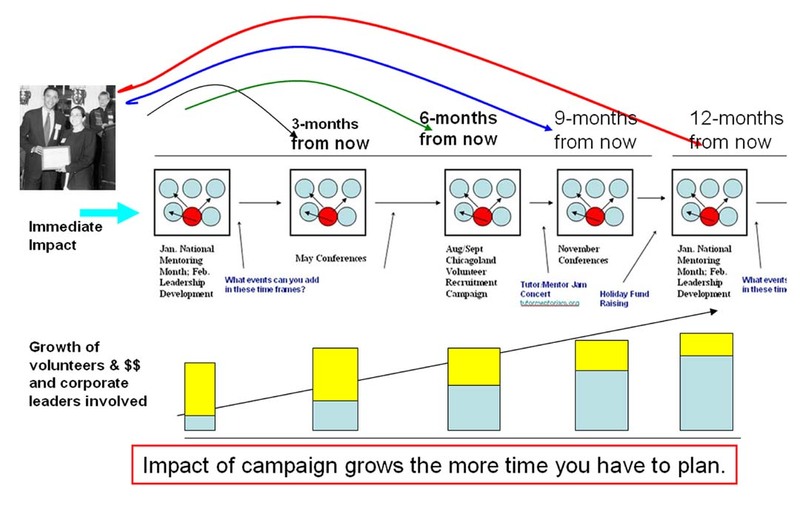 I recognized how difficult it was to consistently attract the talent and operating dollars my program needed to stay in operation from year-to-year and knew from my work in retail advertising at the Montgomery Ward Corporation how big companies support multiple stores through work done by corporate office teams, including advertising. 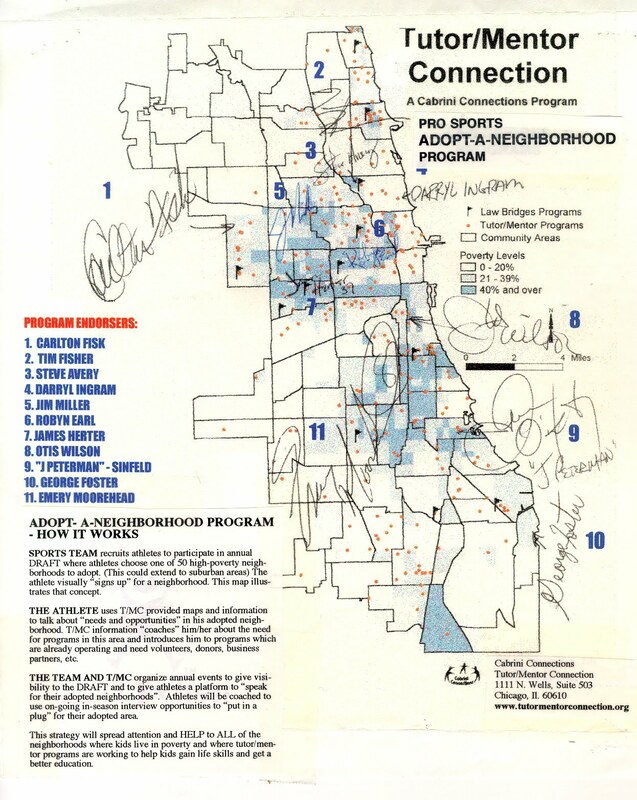 Thus, the the T/MC strategy was to build a list/directory and maps showing locations of existing programs in Chicago, and create events and map-stories that would draw more consistent attention to programs. 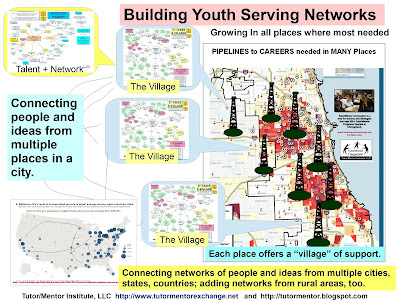 In the above graphic I include a photo of former President Obama, indicating that if visible leaders were to adopt the T/MC strategy, more people would respond, and more resources would flow through the map/directory to tutor/mentor programs in every poverty neighborhood. In the mid 1990s I connected with a group of former professional athletes who were starting a company to sell apparel and raise money to support youth organizations. I explained my idea of athletes adopting neighborhoods and supporting the growth of tutor/mentor programs in those neighborhoods throughout the year. They took one of my maps to a golf event and invited other athletes to sign the map, indicating neighborhoods they would adopt. The list includes several high profile former players. Unfortunately, like too many of the ideas I've dreamed up to support the T/MC strategy, I've never found leaders who would provide time, talent and dollars to fully execute them. However, as today's interview with Bryant Gumbel indicates, the problem is still with us, so it's not too late to take a look at the ideas I've been sharing and look for ways to implement them in Chicago and other cities. If you're involved in sports, at the high school, college, or pro level, here are a few articles that you might read. 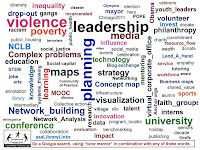 The tag cloud at the right was created using tags shown on the left side of this blog. Click into any category and find articles that focus on leadership, planning, learning, etc. 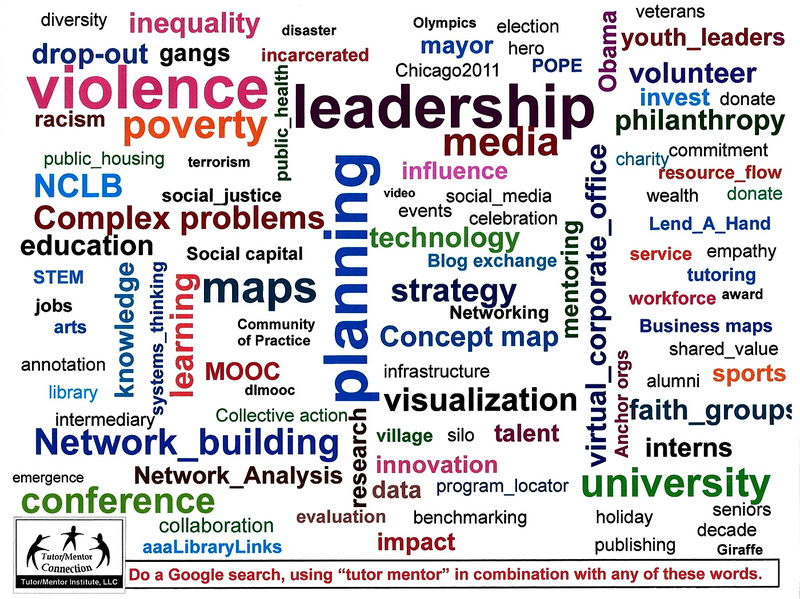 Do a Google search for words "tutor mentor" plus any of the words in the tag cloud, and you'll find many articles posted here in in other blogs, related to that topic. Pro athletes spend thousands of hours over a lifetime preparing to be the best in their sport. If we want to end poverty, inequality or solve other complex problems, we must spend the time reading and learning more about the problem and potential solutions. Don't let the guy in the White House distract you from doing this work. 'Too many walls and not enough bridges"